We would like to use the MOTU 24 I/O in combination with LabVIEW to record sound and generate signal outputs. Do you know if there is a VI that interfaces the MOTU 24I/O with LabVIEW? Good to hear from you again. 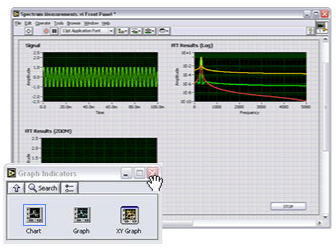 LabVIEW includes a number of VIs that interface with standard audio drivers for both input and output of .wav files. We do this via DirectX. From these you should be able to get a general idea about what LV is capable of, sound-wise. Keep in mind this is all standard LabVIEW; you don’t need the DSP Module (mentioned in the original post) to get these functions. Hope this answers your (Marc’s) question. Now, sure, I could have just emailed that response to Marc. But I’d rather again unleash the awesome forces of Google, which seems to be at its best the more obscure the query. And what is CDM about, if not occasional forays into obscure sound tech? Update: Behringer BCD2000 DJ Controller Not Mac Compatible Yet, Not Really Shipping?